Here’s another one of those muffin recipes my family won’t eat. They won’t touch them, won’t smell them and cringe when I even offer one. They’d prefer fluffy fried doughnuts. But that’s okay, because I froze the batch and I’m going to enjoy their moist, slightly buttery, nutty, banana goodness one or two at a time. All by myself. Muffins really don’t need the huge amounts of oil or butter they usually call for. These ones contain about a 1/2 teaspoon of butter per muffin, giving them plenty of buttery taste without all the excess calories. Instead, it’s fruit that provides moisture and sweetness. Preheat oven to 350 degrees. Spray a muffin pan with cooking spray. 1. Mix dry ingredients into wet ingredients. With an ice-cream scoop, scoop and scrap off excess batter and release into each muffin cup. You may need a second muffin tin for 2 or 3 extra muffins. 2. Bake for about 20 minutes, or until done. Makes 12 to 15 standard size muffins. Per muffin: Calories: 129.9, Total Fat: 3.0 g, Cholesterol: 15.4 mg, Sodium: 351.2 mg, Total Carbs: 22.6 g, Dietary Fiber: 2.4 g, Protein: 2.7 g.
It's better that they won't touch them. MORE FOR YOU! Muffins, whether healthy or not, disappear in this house. Nice to have a little treat tucked into the freezer for you and you alone! Smile. I'd eat these, I promise! I love muffins that taste good and are healthy too! Thank you for sharing with me. I'm about ready to curl up in bed, and now I'll have sweet dreams. I hope you have a great end to your week. Much love! These look SO SO good! You know I'll be making these asap! These look great! 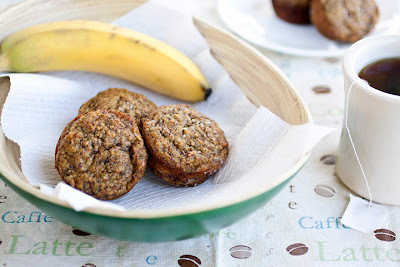 I love that they have no refined sugar in them and they're vegan to boot! Yum, yum, yum! If the family won't eat them, more for you!! What is juice sweetened cinnamon apple sauce? Is it pureed apple sweetened with juice? It's an applesauce product you can buy in little 4 ounce cups at the store. Any 1/2 cup of cinnamon applesauce will work. I'm sooooo excited to have come across these! I have some very ripe frozen bananas in the freezer and have been putting off making traditional banana bread because of the lack of nutritiona value. I agree, all that butter and sugar is just gross. I usually sub unsweetened applesauce for butter and it works great. I'm so glad you can use this recipe! Thank-you for leaving a comment. Mmm a delicious and nutritious breakfast like this is just what I need! Muffins are household favorites. The apple sauce seems to work perfect with it. Oh my. I love this recipe. My husband and I will give these a try! I think we'll like them. I like how healthy they are!